Thor's hammer isn't real, except in the hearts and minds of comic nerds everywhere. Thank your lucky stars, because if it was real just being near it would kill you. 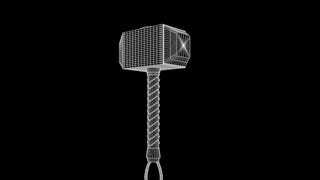 Jake Roper over at vsauce3 has a great video explaining exactly how damn heavy Thor's hammer Mjolnir would have to be if it was actually forged from a dying star (instead of in a dying star). Of course it's just a thought experiment and I am sure there is a very technical explanation involving string theory as to why it doesn't murder you just by being around it. Until then, I'm just going to go with the old standard of "A wizard did it".